The wedi Fundo Riolito neo range of shower trays are pre-formed trays that feature a linear drainage channel that is located right next to the wall. 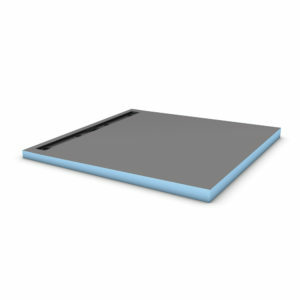 Constructed from the same materials as the wedi Tile Backer Board, each tray consists of a blue core made from extruded polystyrene rigid foam that is reinforced with glass fibre (with alkali-resistant finish) on both sides and coated with a polymer-modified cement. This core is 100% waterproof and remains fully functional even after possible damage. wedi Fundo Riolito neo Shower Trays feature three innovations which deliver real added value both visually and in terms of practicability: a drainage channel right next to the wall, a completely continuous slope right to the drainage channel and a more flexible adjustment to the room situation. 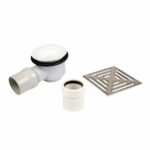 wedi Fundo Riolito neo Shower Trays are available in a wide range of sizes, with a range of different drain lengths. 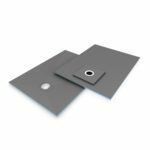 wedi Fundo Riolito neo Shower Trays are designed to be used only with the wedi Fundo Channel Drain Kits – these are available in 3 different configurations. To complete your shower tray installation, you will also need to purchase a wedi Fundo Channel Cover, available in 3 different variations and all drain length sizes. When fitting a wedi Fundo Riolito neo Shower Tray, use wedi Sealing Tape, Corners & Sealing Gaskets along with wedi 520 Waterproofing Membrane and 610 Adhesive to fully waterproof the installation and seal joints between board connections and internal and external corner junctions.